Rick Priestly of GW fame has concocted a new ancients battle game (think Warhammer Ancient Battles, or Field of Glory), and some members of my gaming group gave the game a spin at the Plastic Legions Geek-Cave. Not unlike WAB or similar games, this is done by creating battle lines, made up of blocks of warriors determined to apply violence to their counterparts on the other side of the field. Hail Caesar’s approach to this is decidedly loose, and free flowing with the game’s focus on getting the battle underway. When you read the book, you can tell that this is very purposeful on the part of the writers. While the game isn’t designed to be a super competitive base for a tournament, its rules are quite clean, and elegant in their representation. The big difference between HC and it’s ilk is that it is much less fiddly from a rules mechanic point of view. It all starts with the fairly fun concept of the ‘divisions’ that make up your army. An army may have as many divisions as you like, and each one is an autonomous element that is lead by a division commander. The army can have a proper general which can assist these divisions in many ways, but the real work gets done by the relationship between the division and its leader. Games like this pass or fail in the movement phase in my opinion. Its a lot easier to emulate combat than it is to realistically render maneuvering on a battlefield. Most games that cover early combat have complex systems to dictate what a unit can see, how it advances, charges, and especially changes direction. The ‘wheel’ is a favorite move to be depicted in these games, but often with rules that require a lot of awkward measurements. HC does away with a lot of the intricate rules for maneuvering units, wheeling them, and charging them into combat. The focus is more on how well the division’s commander does at conveying what he wants them to do, than measuring the precise arcs of a wheel and such. When a unit moves it has a variable amount of distance it can traverse based on how clear their commander is in giving an order. A unit of infantry can move up to 3 times a turn (6″ with each movement) based on their division leader’s leadership roll of 2d6 vs what is usually a 7, 8, or 9. If the roll is equal to, or one less than the leadership value, the unit can make one move. If it is two below the LD value, they can make two moves, and so on up to 3 moves, which in the case of infantry would be 18″ of movement. The player must declare what the division leader is telling them to do before the roll occurs, or anything is moved. This is called a move order. These orders can be phrased as precisely as the player likes, but the unit must follow the order as closely as possible. “Move straight forward until you reach the center of the field”, “advance around the left side of the forest and stop at the edge”, or “advance 17 inches forward” are all examples of orders. During our game, vague or overly precise orders caused some issues that we didn’t predict, as some units rocketed forward while others crept along at a snails pace. One thing to note, if you tell a unit to move 4 inches forward, but you are allowed 3 full moves, you can only move forward 4 inches. Occasionally the unit leaders don’t do such a great job of articulating what they want, or the units that they are commanding are fighting amongst themselves. This is what is represented when you roll over the LD value of the unit leader. When this happens the unit can’t move, and the rest of the division (that hasn’t moved yet) sits around waiting for the commander to sort out the confusion. We learned very quickly that it is a good idea to issue orders to high priority units first, lessening the chances of them getting stuck because of a failed low priority order. If your big badass unit of Norman knights has a flank charge opportunity on a unit of infantry, roll that before you see if your Levy spearmen can simply march forward because you arent sure what else to do with them. Combat is another nice area where the game is streamlined without sacrificing too much representation. When units shoot they will have between 1 and 3 dice to roll hits with. In melee combat most of our units had anywhere from 5 to 9 dice to roll. When a unit suffers hits they are subtracted from something akin to hit points as opposed to removing single models. When a unit’s damage meets its stamina (6 in most cases) it becomes shaken, and is likely to flee the field if it is banged up too much more. Between the fairly elegant movement system, and the simple combat mechanics, games of HC move very fast, and are good at keeping people in the action even if it isn’t their turn. This game leans on the casual end of the spectrum vs ones that are more about simulation, but it also isn’t simplistic. Our game involved 3 divisions of 4 units each, per side. It took just under 3 hours, and that was with a great deal of referencing the book to sort out mechanics that we didn’t have down yet. To give you an idea about scale, 3 divisions at that size is about equivalent to 3k-3500 points of WAB. The battle felt pretty epic. While some of the looseness of the game will require players to remember that they are trying to create a shared experience as much as they are trying to test their generalship against the nerd on the other side of the table. Hail Caesar is a solid game that really has it’s priorities straight as far as how gamers should be spending their energy, more in setting up solid charges, or supporting flanks, and less fussing over counting miniatures in contact, and making precise measurements like a carpenter. People who are more used to Tournament style Warhammer may have a moment of culture shock playing this game, and it may not be for everybody, but I for one found this game a giant breath of fresh air! Side-note: I have not played ‘Kings of War’ by Alessio Cavatore, but from what I hear the game takes a similar approach to fantasy as HC does for Ancients. Additionally, HC is somewhat derived from GW’s Warmaster (6mm fantasy battle game). 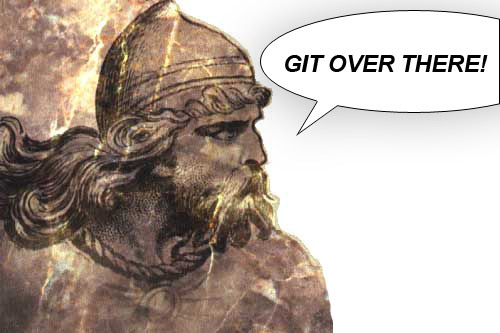 Next Next post: Norman Invasion!